Shah Rukh Khan has compared Andre Russell with Amarendra Baahubali after his brilliant knock against the RCB on Friday, April 5. SS Rajamouli's Baahubali series remains a landmark movie in the Indian film industry for multiple reasons. From the making to its success, everything about the movie is considered to be big. As a result, people have made a habit of using it to describe success and here is one fine example of it. Bollywood superstar Shah Rukh Khan has virtually compared Andre Russell's lightning strike against the RCB (Royal Challengers Bangalore) on Friday to Amarendra Baahubali. "Well played boys @KKRiders @lynny50 @NitishRana_27 @robbieuthappa . 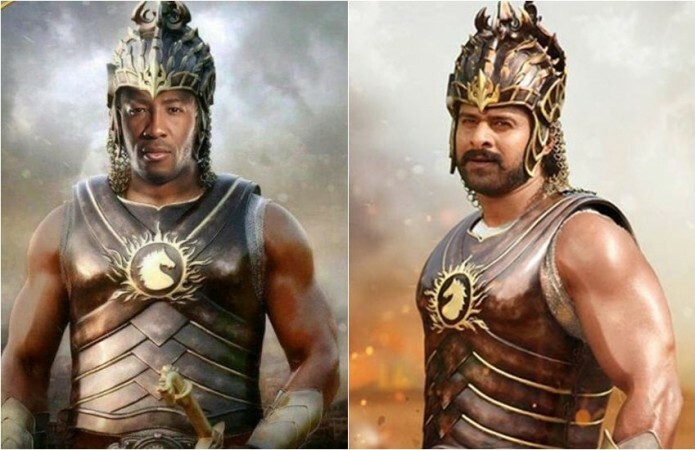 Each one in the team did so well but you all will agree all words of praise r worth less than this picture...[sic]" the King Khan tweeted along with the photoshopped picture of Russell in Amarendra Baahubali's avatar. It is an iconic pose and picture of Prabhas in Baahubali. It symbolises the power of a warrior and Shah Rukh Khan could not have found a better way to describe Andre Russell's winning knock as he superimposed his picture on a photo of Prabhas' character of Amarendra Baahubali. Indeed, he compared Russell's on-field onslaught to the gigantic success of SS Rajamouli's film at the box office. Responding to Shah Rukh Khan's post, the official Twitter handle of Baahubali posted, "Fantastic play @KKRiders Jai Maahishmathi. Let's keep the spirit HIGH... @IamSRK !!." Andre Russell changed the course of the game with his batting treat as he scored 48 of 13 balls. He smashed 7 sixes and a boundary in his brilliant knock, which helped the KKR to win the match by five wickets. The RCB had set the target of 206 and the KKR chased the total with five balls to spare.